With the temperatures still warm outside, it may seem a little crazy to even think about prepping your home for winter, but there’s no time like the present to have things in order. 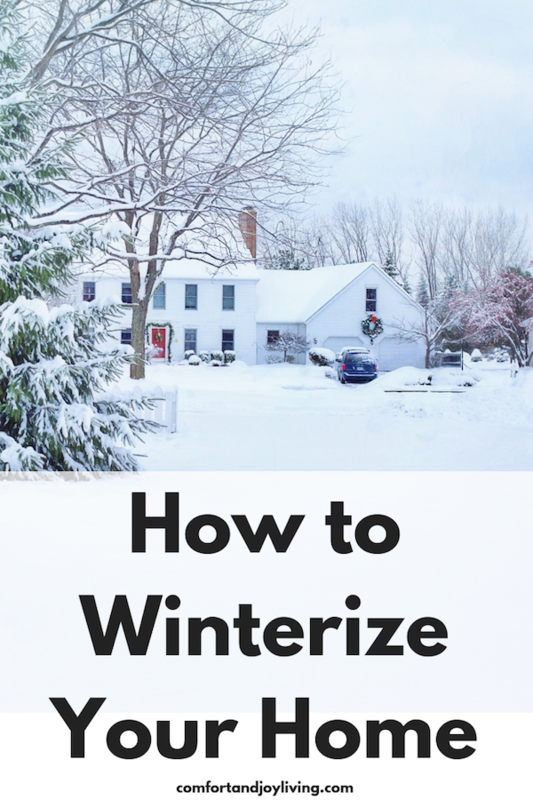 In the mornings where I live, it’s starting to get a little chilly, and as we move closer to the snowfall, ice storms and freezing temperatures of winter, we should not only think about pulling sweaters out of our closets, but winterizing our homes. This year, don’t find yourself a victim of the first winter storm and left without resources. Use this checklist to help winterize your home and be prepared for what will son be coming your way. Make sure pipes are wrapped well. Even if your plumber did a great job and/or you have pipes that don’t typically freeze in winter months, this should still be a necessity on your checklist. Waking up to a burst pipe, or no water for your shower on the first freezing day is no fun. Call in a plumber to check for leaks and insulation, or simply take the flashlight and have your husband crawl under your house to take a look yourselves. Stock wood and/or gas for heat purposes. Do you have a fireplace? Kerosene or gas heaters in your home? Make sure to have plenty of fuel supply before the cold weather hits. Not only will you be prepared for that unexpected cold storm, you won’t have to pay the higher prices for fuel that happen during the season when it is needed more. If your heat source is a furnace, make sure to call in a service person and have them do a full maintenance check. Make necessary updates as needed. If you have a fireplace in your home, you know the importance of having your chimney swept routinely. Give them a call now to come out and clean out your chimney and make sure your home is safe. Trim branches or dead trees around your home. Heavy snow and ice can often cause falling trees in winter months. Look around your property and make sure branches have been trimmed back sufficiently, as well as any dead or dying trees removed leaving your home safe from falling limbs. Now is a good time as any to make all those small improvements to help your heating bill—one of which is insulation. Add extra insulation or replace poor quality with better or more efficient heating during the winter. Replace drafty windows or apply sealant to the outside. Also, this is a great to time to invest in window coverings that are thick and block out wind and air. Replenish your emergency supply kit. Now is the time to check dates on things like medications, non-perishable food items and such in your emergency kit. Replace the lightweight jackets from summer with warm wool blankets, extra gloves and even a cold weather change of clothing for each family member. Candles, canned goods—and a manual can opener—flashlights batteries, water purification kits, extra water, essential oil, and more are needed. Purchase a few of those “hot hands” packets that you’ll see at the checkout counter during cold months; they’re great for helping keep your hands or feet warm in extreme cases. Taking the time to do these simple things before the cold weather hits will help you not only be prepared in advance, but also save money. Seasonal items are always less expensive pre-season, even things like having the chimney sweep come out can be significantly less now than in the middle of a snowstorm. Take the time to winterize your home this fall before a cold spell hits and it’s too late!